Colleges have hit out at an “incredibly unfair” flaw in the notorious English and maths condition-of-funding rule – which makes it impossible to achieve 100 percent compliance, and could cost them funding. An Education Funding Agency rule states that any study-programme learners who don’t already have at least a C in English and maths must continue studying those subjects – or their provider will lose cash in the future. According to the EFA, last year the sector “maintained compliance at around 97 per cent”, but it insisted that progress still “needs to be made in achieving full compliance”. It also requires “any school, college or provider that isn’t fully compliant to submit a robust compliance plan”. However, exclusive FE Week analysis has demonstrated a glaring flaw in the EFA’s own methodology, which effectively makes it all but impossible for colleges to comply in full, even when all learners are enrolled on English and maths courses. The problem emerges when a learner drops out of their course after 42 or more “days in learning” – the length of the qualifying period – for their main study-aim, but with fewer recorded days for English and or maths. The EFA’s own system qualifies learners like these as ‘funded’, because they passed the qualifying period, but not as complying with the rule, even if the last day of attendance on each course is a few days apart. If more than five per cent of learners don’t comply, the EFA starts to withhold funds. However, if a learner drops out before completing their main study-aim as well, they aren’t recorded as funded – meaning the college doesn’t lose money. FE Week has spoken to many colleges about the impact, and we estimate that as many as 9,000 college learners across England could be affected by this failure in the system. Sarah Molyneux-Walker, director of MIS and exams at Peterborough Regional College, told FE Week that 18 of its students had been directly affected. “For us 100 per cent compliance would be impossible,” she said. Mark Ashton-Blanksby, head of internal audit at ICCA Education, Training and Skills, which provides internal audit services for more than 40 colleges, insisted that the system is at fault – not colleges. 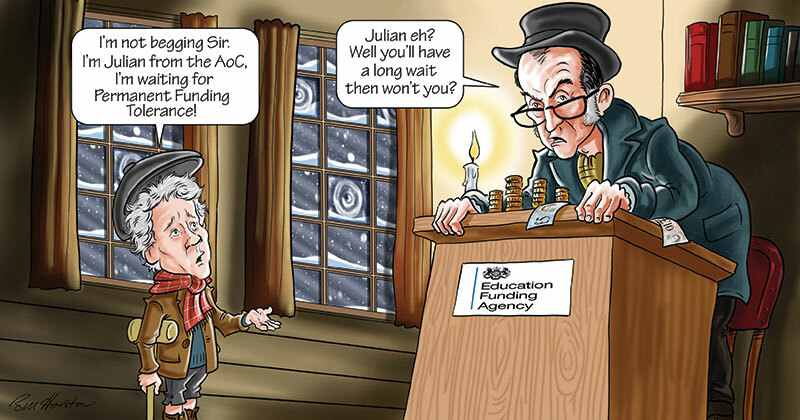 “The EFA funding methodology itself is preventing colleges achieving the target of 100 per cent compliance, so it is inherently unfair to hold providers to account,” he said. This revelation has prompted some to call for the five-per-cent threshold for compliance tolerance – first introduced for the 2016/17 allocations, and now extended to 2017/18 – to be made permanent. This means that if less than five per cent of a college’s learners are non-compliant, the college will not lose funding. Julian Gravatt, the assistant chief executive at the Association of Colleges, agreed that the tolerance should be made “a permanent part of the funding method”. A college manager, who did not want to be named, warned of what might happen if the tolerance were removed, saying that they believe that some colleges “might be tempted to be less than honest with their end dates in order to ensure that all such students meet the condition of funding”. The DfE denied its systems were at fault – but then appeared to contradict itself by admitting the existence of the quirk.